At the end of September 2017, an unusual training on human rights was held in Berdiansk within the framework of the Animation Festival “Ravlyk-Fest” [Snail-Fest]. Its participants not only listened to the trainer but also themselves participated in the creation of educational material – an animated mini-film about the rights of the child. During the first day, the children learned about the basis of human rights, mechanisms for their protection, and how to recognize violations. During games, exercises, and conversations, participants received information and learned to work with it in practice. For example, they examined the situations in which their rights could be violated, and they were looking for solutions. The whole second day was devoted to the production of a cartoon. The theme was chosen “Right to Education”. First, the young people of Berdiansk discussed the scenario, which was based on a real history of peers from Donetsk Oblast. Then a frame-by-frame plan, and characters were created. 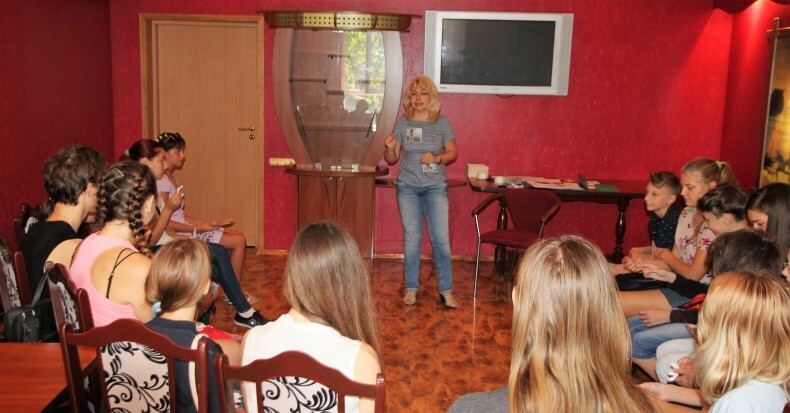 Anastasiia Lukashevych, an artist, designer, and animation coach, who also coordinates the project “Workshop on Peace Cartoon Production”, also helped the participants. After the training, some teens shared their impressions. The event was held at the First Anti-Caffe of Berdiansk “Chas Ye!”[There is time!] within the framework of the project “Active Civic Action to Overcome the Humanitarian Crisis in Ukraine”, implemented by the Civil Union “Educational Human Rights House – Chernihiv” with the assistance of the National Endowment for Democracy (NED). The project is part of the action plan of the Ukraine-wide educational program “We Understand Human Rights”.